The horrors of the war-torn regions of Sudan are unimaginable. In 2012, Daniel Omar lost both of his arms from a bomb dropped by his own country. First reported by Time magazine, his plight got the attention of the CEO of Not Impossible Labs, who want to use their 3D printing technology to give Daniel new hope. 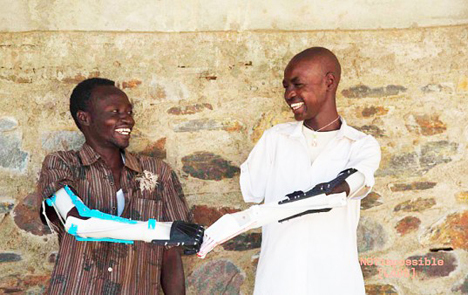 In South Sudan, 50,000 amputees, including Daniel, are receiving 3D-printed extremities. 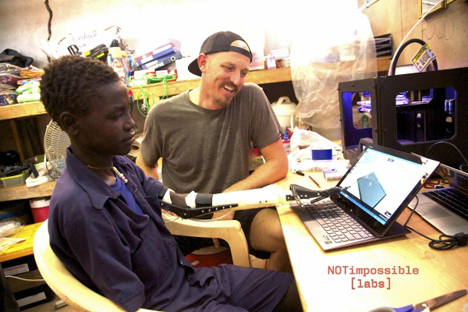 It sounds like a big order for a guy, a laptop and a 3D printer – which is why CEO Mick Ebeling set up a lab at a nearby hospital dedicated to building affordable 3D-printed prosthesis. Locals are being trained to help build the prosthesis, and the cost for each one is an incredibly low $100. Of course a $100 prosthetic isn’t going to be the same as a $5000 one. The 3D printed Ebeling prosthetic can’t lift as much, and the hands, with limited mobility, require special attachments to eat with utensils. But the independence is insurmountable. They allowed Daniel the pleasure of feeding himself for the first time in two years.